Melbourne teenager Grace Halphen had a tough time transitioning to high school – she struggled to make friends and fit in. When she realised that this is a common experience, she wondered why she’d felt so alone. 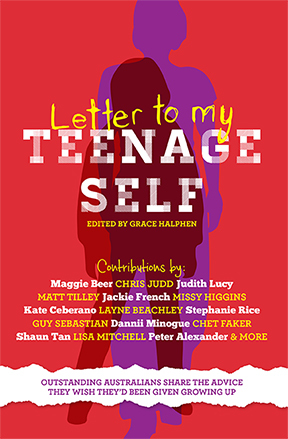 At thirteen, Grace embarked on a project to contact all the Australian public figures she admires, asking them to provide advice to help teenagers navigate the inevitable ups and downs of adolescence. 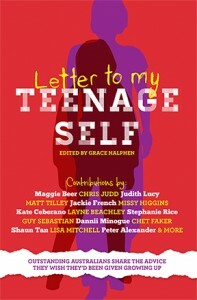 In Letter to My Teenage Self, more than 50 prominent Australians write heartfelt letters to their younger selves, passing on the wisdom they wish they’d had at the time. From learning to laugh at yourself (Adam Gilchrist), realising that the qualities that make you stand out are the ones that make you so rad (Missy Higgins), not letting the negatives shape who you become (Guy Sebastian), practising gratitude (Nathan Buckley), and the reassurance that you’ll get over anger about people treating you badly because you’ll get better at treating yourself well (Judith Lucy), Letter to My Teenage Self provides inspiration for parents and teenagers alike. Maggie Beer, Chris Judd, Judith Lucy, Matt Tilley, Adam Gilchrist, Jen Cloher, Jackie French, Missy Higgins, Nathan Buckley, Kate Ceberano, Josh Frydenberg, Layne Beachley, Stephanie Rice, David Koch, Guy Sebastian, Alice Pung, Dannii Minogue, Chet Faker, Shaun Tan, Richard Joseph Frankland, Lisa Mitchell, Jo Stanley, Peter Alexander.